Our renaissance cotton shirt features a typical stand up collar and lace-up front neck. The sleeves are extra roomy and end in a gathered elastic cuff. 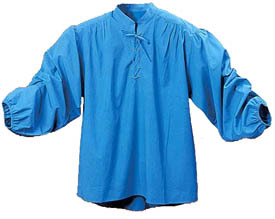 Added billow for the period style is given by the tucks at the back yoke, sleeve tops, and the front of the yoke. Available in your color choice of Marine Blue or Cocoa Brown. 100% Cotton. Sleeve 32.5" - 33" 33.5" - 34" 34.5" - 35" 35.5" - 36" 36.5" - 37"